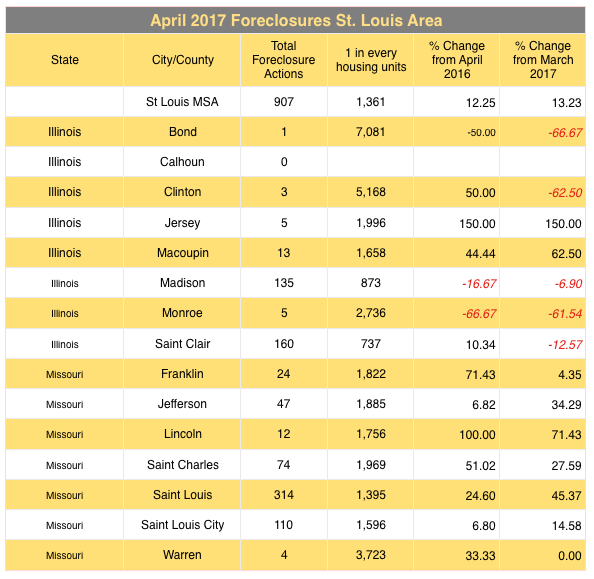 There were 1,814 foreclosure filings on homes in the St Louis metro area during the month of April 2017, an increase of 13.23% from the month before and an increase of 12.25% from April 2016, according to a report just released this morning by ATTOM Data Solutions. As the table below shows, all 7 Missouri Counties included in the report saw an increase in foreclosure activity last month from both the prior month as well as a year ago. Of those, Lincoln County (which has very little foreclosure activity) saw the largest year-over-year as well as month-over-month increase, follow by St Louis County with a 45.37% increase from the month before and Franklin County with a 71.43% increase from a year ago.